We stayed 1 night while passing through the area. This park gets it! It only lacks paved/concrete parking pads. The park is a short drive from I-84 (Exit 29) along busy multi lane city streets. The intersection is controlled making turns onto the street easier. The interior roads are paved. The interior roads have sufficient width and gentle turns making maneuvering larger RV’s easy. There is a mixture of back-ins and pull through sites. This park seems to understand the simple concept of the importance of a flat, level site as the sites were generally level and flat. The parking pads are rock. The P/T sites were long enough to say connected to a toad. Sites had sufficient room for opening slides. They have full hook ups – water, electricity (50/30/20 AMP), & sewer. The utility connections were spread out along the middle to rear of the sites. The sewer connection was at ground level making it easy to establish a downhill flow depending on discharge point. Sites have an outside table on a concrete patio but no fire pits. 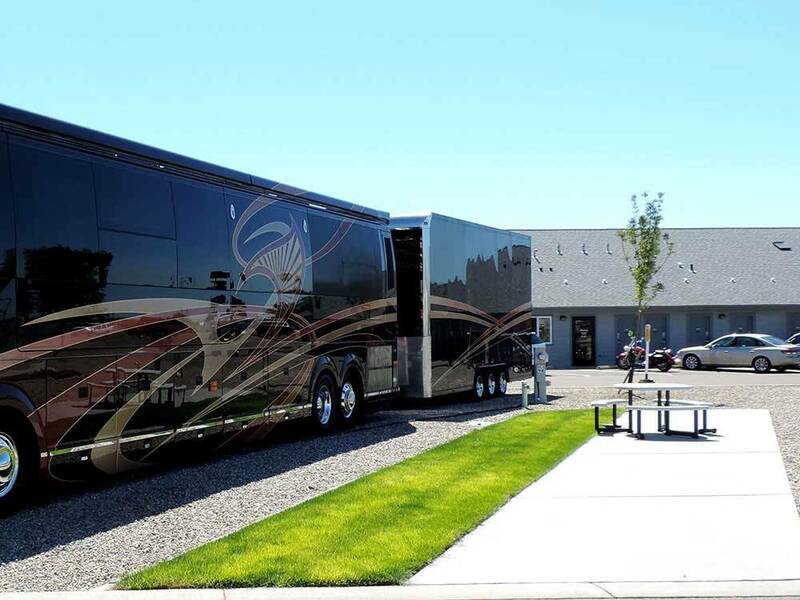 Site orientation allows RV’s to cast shade onto the patio side. Distance, grassy & gravel areas establish privacy between the sites. Some of the sites appear to be extended stay sites. There were a few young trees scattered throughout the park and around the perimeter so satellite reception would be dependent upon your site and dish configuration. The park information listed about 37 cable channels but didn’t mention anything about broadcast channels. Didn’t try to get any broadcast channels. The park provided WiFi was good. It was password protected. Didn’t try our Verizon WiFi hotspot or NET10 phone so don’t know about reception. There is one designated fenced pet area with a grass surface located at the front of the park and another unfenced designated pet area along the street. It appears 2 sites were transformed into the dog park - impressive. There were bag dispensers and collection stations for waste in the pet areas. There was sufficient area to walk dogs along the park’s roads as well as a path around the park’s exterior perimeter. We would definitely stay here again when traveling through the area. TIP: There is a Flying J station just down the street. Stayed one night in September just passing through with 35' class A and toad. Sights gravel and level. Hook-ups orderly. Did not have to disconnect toad. Quiet park. Sun comes up and all goes off the rails. Apparently there was scheduled pavement resealing for the next morning. No-one bothered to tell us. There was apparently a "mystery" route left to exit the park, but we didn't see any signs that would indicate said route. Got blocked in, had to unhook toad, terrible morning, may have said some inappropriate things. Point is why wouldn't management tell us of scheduled work that may affect us? This is a very nice, well maintained park at a very reasonable price ($36 w/GS). Mostly concrete and gravel, but there is a nice strip of freshly cut grass at every site. Staff is always seen going about their chores with a smile and friendly greeting. WiFi is fast enough for streaming and there are WiFi antennas throughout this large park. Our 2 small dogs enjoyed the grass both in the bark park and also outside the fence area along the frontage road. There are convenient locations for their poop bags also. Did not use restrooms. We will be back someday I'm sure. Ambassador RV park has nice amenities - nice laundry room and rest room facilities, friendly staff, level parking pads, and picnic tables. You should know, however, that the park basically sits at the end of the runway for a regional “industrial” airport which begins flights early in the morning, and is also right off a busy 4-lane road. If you’re looking for peace and quiet, you may be disappointed. Easy to and from I-84; warm welcome at check-in; utilities perfect for our RV; early morning garbage pick-up. If you are traveling through Idaho, You must stay at this campground. On Good Sam's 10-10-10 rating system, this is a 11-11-11. Restrooms are immaculate and the grounds are perfect. Staff is friendly and very helpful. We will return as soon as we can. Well maintained facility. Sites were well maintained, individual bathrooms were cleaned daily. WiFi works more effectively when you are inside the community room. I will stay there again. This is a superb RV resort with all the goodies. We used it as base for Boise area. Value priced for all you get. Very friendly staff. Bathrooms are individual rooms. No shade, just gravel pads. Would stay here again. Nicely maintained park. Looks newer, although it is 11-yrs old. Pool and jacuzzi in great condition. Large pull-through sites with plenty of elbow room, strip of grass and concrete at each. Site itself is round rock, which is fine. No trouble leveling. Most trees are still small. Great facilities, including laundry, game room, TV area, common area, pool, small playground for kids. Was able to wash our trailer without paying extra. Rate was very reasonable at about 2/3 the price we would have paid at a KOA. Recommend this park wholeheartedly. We stayed one night on their giant, pull through, level, gravel sites. We did not use any of the other facilities. We were greeted when we drove through the gate and were escorted to our site.The park was clean and our site had a patio and small table and seating. This is an absolutely gorgeous park and would stay again. Very clean and well maintained! Nice wide sites! Will definitely return! Very nice park. Only wish it had been for more than one night. Very nice RV park. Lots are very wide, long and level gravel pads. Large enough to park additional vehicle or trailer. Located far enough away from the interstate and train tracks so there is very little noise. It has a very large fenced in dog run with benches and doggie bags. Bathrooms are private rooms with shower, sink and toilet per room. Personnel was very friendly and helpful. WIFI requires a secondary login on the web. I would stay there again. This is the second time we have stayed here and we love it. Sites are nice size and have a strip of grass and a table at each site. The dog park is great. Nice clean pool, staff are great to work with, have family in the Boise area and will always stay here when we visit. The Ambassador is very clean and there is plenty of space between rv pads. There is a feeling of openness and calmness. The staff are friendly and helpful. There is a nice fenced in dog area as well as lots of dog walking area around the outside of the park. It is well located in relation to the highway. It is one of our favorite parks and we have been there many times. The rates are well priced. They have a pool, laundry area and game room which are very nice. It is located in a windy area so the wind can be very strong during the spring and fall months. This is an outstanding RV park with great amenities, wide roads and parking spaces. It appears to be quite new. The staff if friendly and the price is very competitive. Bathrooms were private 6 regular and 2 handicaped. Pull through wide sites with gravel pads. Water, elect, TV, and sewer connections were very good. Great reception area, laundry room, day room was in great shape. Pool was in great condition. Staff was courteous, friendly, and knowledgeable. Park was in excellent shape. It is within driving distance to restaurants. easy location from the highway, although not that close to Boise, use this if you are on the road to another destination, every thing was very clean and attention to detail is their priority, would definitely stay again.